After all the successes Armin van Buuren’s had in the past few years, another milestone will be added on his list - a cinema release in Hong Kong. The live registration of his ‘Armin Only – Mirage’ concert of 2010 will be premiered on May 18th 2012. It is the first time ever that the show of a DJ is being shown in Asian cinemas. According to OdMedia Licensing in Utrecht, that hosts the theatrical exhibition together with record company Armada Music, the worldwide interest in dance content has increased extensively. Especially for Dutch DJs and festivals. 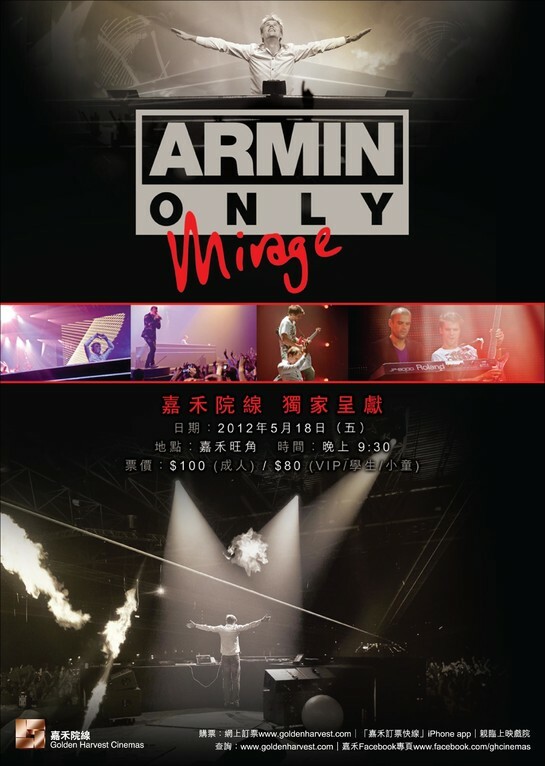 The live registration of ‘Armin Only – Mirage 2010’, the show that took place on November 13th 2010 in the sold out Jaarbeurs venue in Utrecht, will be shown at the Golden Harvest Theatre from May 18th on and will be exploited throughout the whole of China when successful. For more information, click HERE. The ‘Armin Only – Mirage’ Blu-Ray/DVD is also available to buy HERE.